Plug adapter allows you to connect your 3D printer or any electrical devices on your country plug. 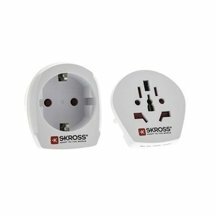 On Makershop website, you can find adpaters that let you convert French electrical plug into Italian, Swiss and UK plugs. We also sell USA/Europe adapter that lets you connect your 3D printer on European plugs. All of our adapters are manufactured with high quality process to make them easy-to-use and safe. Our technical team is available to give you more details about the plug adapters. Plug adapter FR/UK to convert French plug into UK plug. Plug adapter FR/IT to convert French plug into Italian plug. Plug adapter FR/CH to convert French plug into Swiss plug.